All of the Heartlake City animals get the help and care they need at the Heartlake Vet. Mia helps out and learns to take care of her furry friends. Help the veterinarian to get all of the cute little critters back to health! Examine them all on the examination table, check temperatures, apply the ice pack, listen to heartbeats and feed the animals their medicine. LEGO model number: 3188: Weigh them on the scale and even take x-rays! Decorate their cages with butterflies, ladybird and flowers! Includes 3 animals, Mia and Veterinarian Sophie mini-doll figures. Size H28.2, W6.1cm; For ages 6 years and over; EAN: 5702014831513. WARNING(S): Not suitable for children under 3 years old. All of the Heartlake City animals get the help and care they need at the Heartlake Vet. Mia helps out and learns to take care of her furry friends. Help the veterinarian to get all of the cute little critters back to health! Examine them all on the examination table, check temperatures, apply the ice pack, listen to heartbeats and feed the animals their medicine. Weigh them on the scale and even take x-rays! 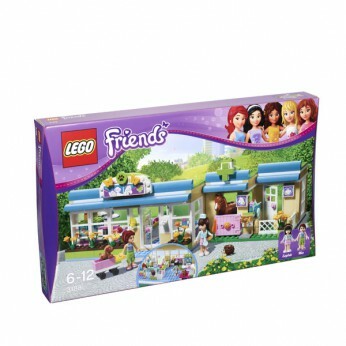 Includes 3 animals, Mia and Veterinarian Sophie mini-doll figures.Nurse the cute critters of Heartlake City back to health at the Lego Friends Heartlake Vet. Assess the three animal figures on the examination table, check their temperatures, listen to their heartbeats and give them their medicine. Help the Mia and Sophie mini-doll figures weigh the animals and take their x-rays. You can even decorate their cages with butterflies, ladybirds and flowers. This toy costs approximately £25.99 (for the latest and best prices make sure you check our retailer list for the LEGO Friends Heartlake Vet 3188 above). In our review of LEGO Friends Heartlake Vet 3188 we classed it as being suitable for ages 6 years, 7 years, 8 years but recommend you check the manufacturer specific advice before purchasing.